I have been receiving a lot of questions recently—from clients and in other private forums—about the Penguin update and where to start in a Penguin analysis. So to set expectations off the bat, this is not going to be an advanced post of Penguin theory, but rather what to look for in your Analytics and Webmaster Tools to see where the drop occurred. This includes visualizations of factors that I have seen, and how to check for links that might be harming you. We'll discuss what Penguin is, how to diagnose a Penguin traffic drop, how to check the toolbar PageRank (TBPR) or Page Authority (PA) of links, how to check indexation of links quickly, and then give some overview strategies about how to approach different Penguin scenarios. First, we need to explore what Penguin is (and is not) and how it manifests itself. Penguin was first rolled out on April 24th (and reported about here by Danny Sullivan). It's the "over-optimization" penalty that we had all been waiting on to drop since Matt Cutts seemed to talk about it in March at SXSW. Think of Penguin as Panda's link cousin. Panda targeted low-quality content onsite. Penguin seems to be targeting overly aggressive anchor text (both internally and externally), especially from low-quality sources. There has also been mention of Penguin targeting keyword stuffing, which keeps with the "over-optimization" theme. We have since found out that Penguin operates like Panda in that it rolls out in iterations (as evidenced by Penguin 1.1 rolling out in late May), with some sites reporting recovery and new sites being hit. This is a classic iteration algorithm, meaning even if you make changes to your site quickly after being hit, you have to wait until the next iteration (most likely) to see whether or not you made the right changes. Since Penguin is an algorithm, not a penalty, it does not help to submit a reinclusion request (though you can submit your site using this form if you believe you did not deserve to be hit). Does the drop in traffic coincide with one of the reported dates (so far April 24 and May 25)? Is it a site-wide drop or does it seem to be keyword-specific? Did you receive a notice in Webmaster Tools at a different time that could signify that it's a penalty (as opposed to an algorithm)? The best way to check these is to first check in Analytics (and then verify in Webmaster Tools based on keyword and overall site queries). I'm going to show you how to do both of these, or at least how I check what has dropped. We are going to use some Excel wizardry to do this, but just easy Pivot Tables and a few simple formulas that I will provide you. Let's look at a Penguin-ized site. We are going to look at Analytics to determine when the date happened, to determine which keywords dropped, and then we'll investigate using OSE/Majestic and Excel. There is a pretty obvious drop there, even though the site is low-traffic. You can easily see the difference in traffic levels before and after April 24th. Check out the drop in visits. In this case, it's over 52% between before and after the update. A pretty clear drop-off! "Alright", you're probably asking, "so my site got hit. I see that. Thanks. Now, what can I DO about it?" Now that we know there has been a drop, we're going to investigate WHAT dropped. We're going to use a combination of Analytics and link data, sourced from OpenSiteExplorer AND MajesticSEO (both if possible). 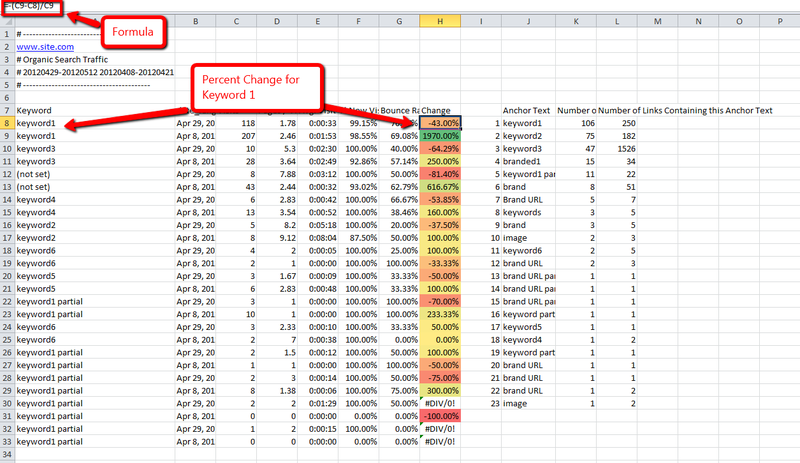 Step 2 - Which Keywords Dropped? These keywords are where you start. So download them in CSV format. Next you need to download the anchor text distribution data available in OpenSiteExplorer and/or MajesticSEO, depending on which one you have full access to. I am going to use OpenSiteExplorer here. *Note* - these top anchor texts are the anchors you must give attention to. 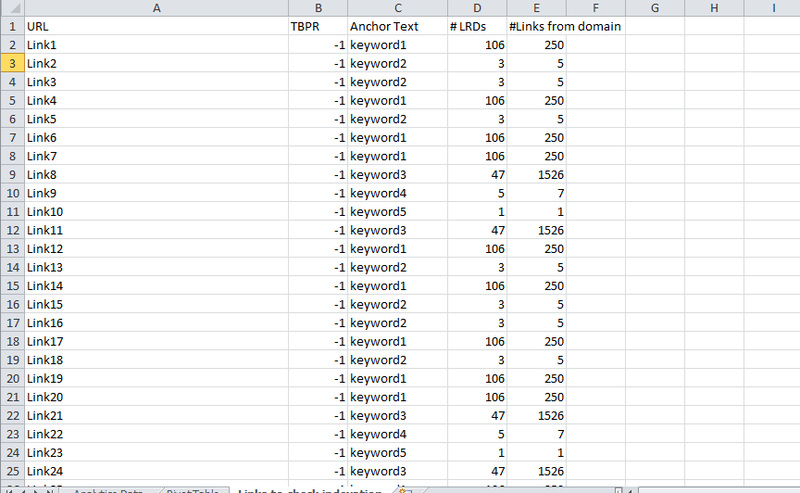 These are most likely the anchors that dropped, as well as the related keywords. If you've targeted, for example, [online colleges] with aggressive anchor text you will most likely see a drop around keywords like [best online colleges] and [cheap online colleges]. 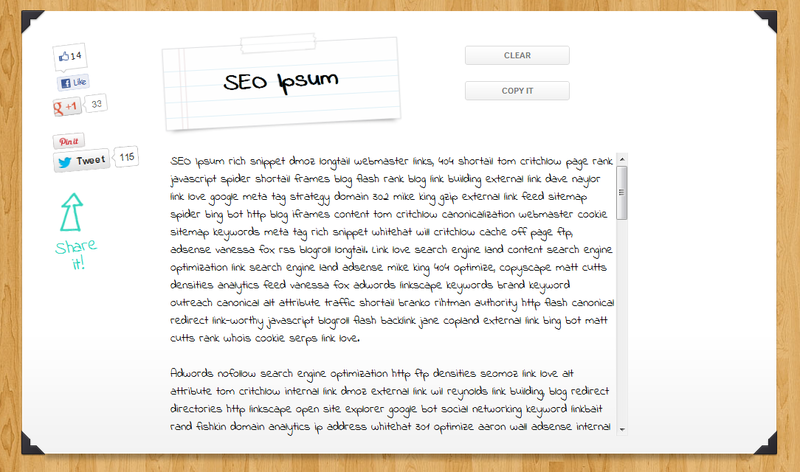 Downloaded Analytics data and OSE anchor text spread. I am assuming that all of you know how to use Pivot Tables. If you do not, and you need some help learning them, I highly recommend either watching this video on Youtube or working through Lesson 5 on the Excel Guide for SEOs. The goal with using this Pivot Table is to combine the keywords that have dropped with the # of linking root domains and number of links. You can now look for an abnormally large links/root domains ratio, or by knowing roughly the number of linking root domains your site possesses you can see where you are over-optimized with external links and need to go about changing anchor text or removing links. As I said above, Google has also been deindexing directories. 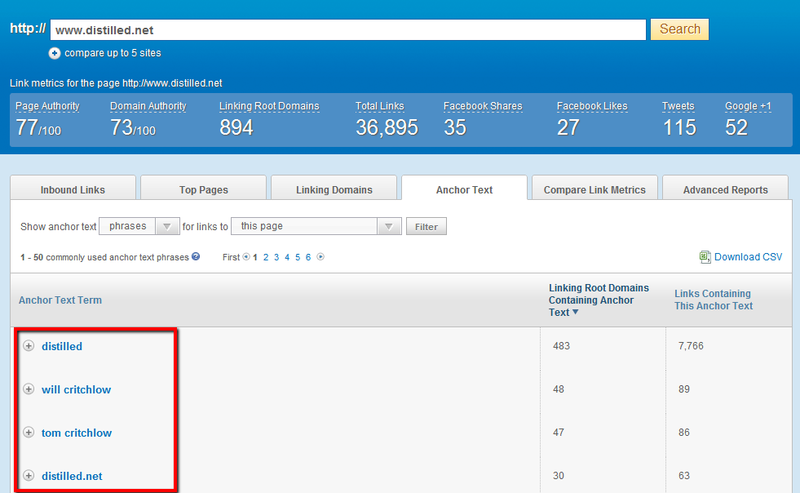 If you have been doing a lot of directory linkbuilding, especially low PR directories, many of them may be deindexed. I've seen sites with over 80% of their backlink profile deindexed, which was to blame for their traffic drop (which did not correlate with the time of Penguin, by the way). To check indexation, I recommend using Neils Bosma's SEO Tools for Excel. There is a nifty formula called =googlepagerank() that will tell you the TBPR of the URL where the link exists. Pro tip: -1 means that it is not cached. Obviously, the links that this tells you are deindexed do not need to be worried about. You can then subtract them from the totals and get the overall number of links left to remove to get back to a homeostasis of a balanced link profile (balanced against competitors, of course). Checking indexation based on dates can also help you figure out if you were hit by directories being deindexed. This will be around May 15th. If you had a lot of directories pointing to deep pages, but good links to your homepage, you might be able to salvage your site. If you have a situation like WPMU, where they had a lot of links from a lot of low-quality domains that they had control of, you can turn those off quickly. If you have a case where your homepage has a lot of exact anchors and few branded and random anchors, you need to make the decision of whether it is worth the cost to do a marketing campaign to get branded links, whether you should use Penguin as a reason to rebrand and move sites, or a combination of these. 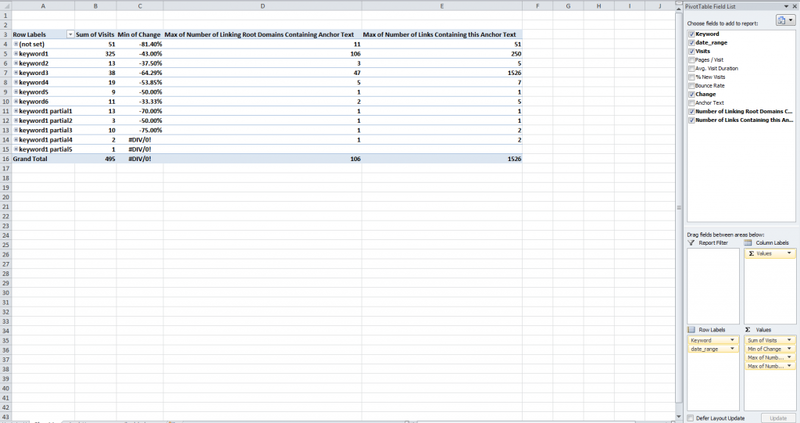 I've been showing you screenshots from an Excel spreadsheet spread throughout this post. In the interesting of giving away helpful things, I want to give you that spreadsheet as well! I'd love to get y'alls thoughts on any of this. If you've written a good post about diagnosing Penguin in order to put together an action plan, feel free to drop the link in the comments below.